The PlayStation 4 and Xbox One are about to get replaced by newer, more powerful versions of themselves. Sony MicrosoftThe PlayStation 4 and Xbox One are getting left in the dust. Maybe you’ve heard of them referred to as “Project Scorpio” and PlayStation 4 “Neo” — these are the two code names given to the projects by Microsoft and Sony, respectively. Both are capable of playing current PlayStation 4 and Xbox One games, of course. They will function in much the same way that your current PlayStation 4 and/or Xbox One does. The big benefit with both is added horsepower, enabling games to be played in stunning 4K/UltraHD resolutions. Simply put, 4K and UltraHD are the next evolution of television (like standard definition was to high definition, such is high definition to 4K/UltraHD). These consoles are a direct result of that evolution, adding horsepower to push games that are better looking than ever before. And in the case of Microsoft’s Project Scorpio, the horsepower jump is especially huge. The chip at the heart of Scorpio is extremely powerful, and it looks to be surrounded by an enormous amount of memory. 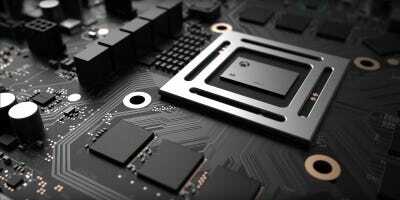 Based on what we know so far, Scorpio’s graphics processor is “around 40 per cent faster” than the equivalent inside Sony’s new PlayStation 4 Neo console. Simply put: Project Scorpio is the most powerful gaming console ever built. MicrosoftMicrosoft didn’t show what Scorpio will look like just yet. We’ve only seen the motherboard inside. That’s according to an extensive breakdown of Scorpio at Digital Foundry by Richard Leadbetter, a reliable expert on gaming hardware. Specifically, this comes down to both raw processing power (the new graphics processor chip in Scorpio) and memory. In the image above, the graphics processor chip is surrounded by what looks to be 12GB of GDDR5 RAM — enough memory to give Microsoft’s newest Xbox One yet another edge over the PlayStation 4 Neo. Leadbetter argues that, “Sony’s technological advantage will be gone with the next wave of hardware,” due to the jump in power between the original Xbox One and the new Project Scorpio. Notably, the current PlayStation 4 outstrips the Xbox One in the power department. This doesn’t have a huge impact on the average owner, but it’s enough for many early adopters to choose the stronger of the two systems. And those early adopters have an outsized effect on which console ends up becoming “the” console to own, setting the standard by which many millions of slightly less tech-obsessed will soon follow. Part of the Xbox One’s story ahead of it becoming commercially available in 2013 was that it wasn’t as powerful as the PlayStation 4. That story may be reversing with the launches of the new Xbox One and PlayStation 4. Of course, all of this bleeding edge tech comes at a price. Leadbetter smartly points out that the more powerful internals of Scorpio also likely means a higher price point. “We would not be surprised to see Scorpio cost significantly more than Neo — maybe even $100 more,” he writes. And for many, price is an even more important factor than sheer power. And did we mention you’ll need a 4K/UltraHD TV to actually take advantage of the higher resolutions these consoles are capable of powering? Because you totally will. That’s another major expense to take into account when considering either of these new consoles. All that said, with no release date for PlayStation 4 Neo (rumoured to be fall 2016) or Project Scorpio (it’s scheduled for “holiday 2017”), there’s still plenty of time to start preparing your bank accounts accordingly. In the meantime, if you’d like to go even deeper into the hardware powering the most powerful game console ever created, check out Eurogamer’s Digital Foundry right here.